I meant to share this in June, when I stayed at El Blok for the first time. It was my ninth June vacation in Vieques. I had stayed at Malecon House for seven straight years. But with that inn under new management, I decided to give El Blok a try. I'm glad I did. I had been to their bar and restaurant in previous years. But this was my first time as a hotel guest, and I loved it. 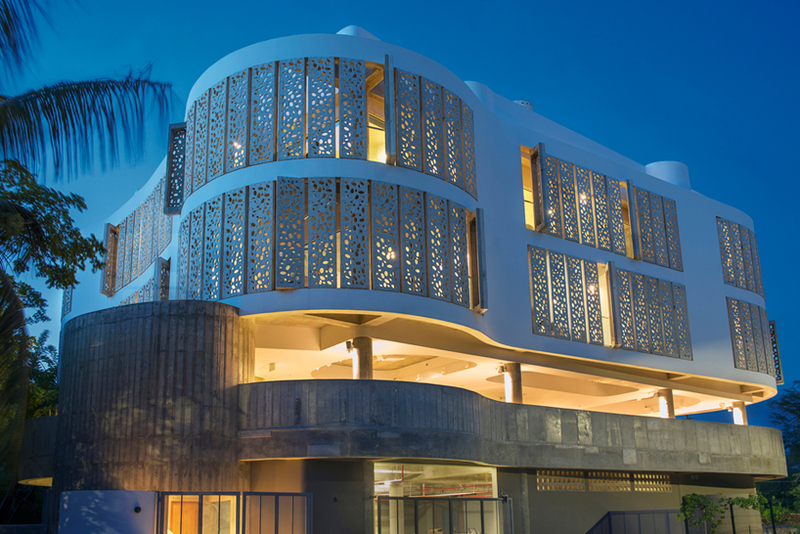 Despite some door lock issues (I think their security server lost power a few times), and the failed promise to provide a cooler to take to the beaches every day, I think El Block is a fantastic, modern hotel to make one's "base" during a stay in Vieques. The longer the stay, the better. Don't just visit for the bio-luminescent bay. Stay for the beaches and one of the best bars in the Caribbean. The eye of hurricane Maria passed very close to my favorite island. It will be several weeks before the recovery can begin. The cleanup is still ongoing. Here's an overview of he hotel, designed by Fuster + Architects. And here are detailed photos and floor plans of the hotel available at Arch Daily. Here are a few shots of El Block after Maria. The storm blew inches of sand onto the main street through Esperanza. El Blok is the concrete structure.